Good morning to you all from Calgary! I had an amazing clinic last night at the MEC store here and I couldn't have been more pleased with the reception. The people in attendance were excited to learn some news ways to help with their recovery from their training for marathons, bike races, and hiking expeditions. From the USA to Canada! 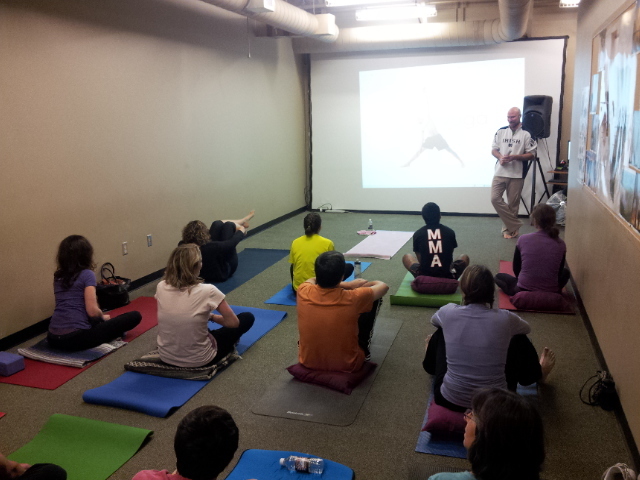 PrAna and REI Yoga for Athlete's tour heats up! REI in Dallas,TX I love the prAna mannaquins in the background:) . Happy new year! 2013 was a great year for me, as I was able to work and learn under endurance sports coach, and yogi Sage Rountree. The " Sage experience" was such an amazing one for me. It allowed me to end 2013 with confidence, focus and a deeper understanding of how yoga helps athletes to grow in a positive way. Plus it has enabled me to walk into 2014 with a exciting, new opportunity! In February and March, I’ll be traveling to REI stores around the country to show you exactly how yoga will enhance your strength, flexibility, and focus, in sports and in life. These presentations are free (and even come with swag!) thanks to the kind folks at prAna. I’ll be in the Midwest, Texas, and Southern California for my part of the tour. My mentor, Sage Rountree will be on the West Coast, in the Rockies, and along the eastern seaboard. Sage is a wonderful teacher who works with several collegiate teams at North Carolina and will be leading a Teaching Yoga to Athletes workshop at Kripalu(one that I'm assisting at:), as well. She will also have books to sell and sign on her tour spots, and in select locations there’s a special meet and greet for REI members. Please sign up soon for these clinics—they are filling already. Well see you there!